He was talking about El Bernameg (“The Show”), his new show that began airing the first day of Ramadan (Ramadan is the traditional time to launch new TV shows). For those who don’t know, Dr. Bassem Youssef is a medical doctor who participated in the Jan. 25th uprising, and was appalled by the performance of the Egyptian official media. His ability to deliver sarcasm is superb even in Egypt, where this has long been a performance art, and with the assistance of several friends, he created Bassem Youssef’s B+, a five-minute broadcast on the model of the US Daily Show. 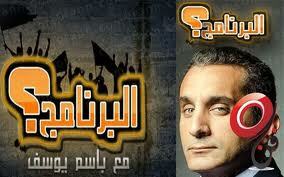 You can read my earlier post about Bassem Youssef here. The show was an unparalleled success, and Egyptian TV networks supposedly fought over a contract with him. At any rate, his show now airs on ONTV, one of the two major independent networks. The new half-hour show started with a criticism of Syrian official media for operating the same way Egyptian official media does, and just kept being funny all week long, mocking such things as the Arab world’s silence over the ongoing atrocities in Syria, the inability of Egypt to get convicted businessman Hussein Salem extradited from Spain, the ongoing ambiguity of the interim government, and more. He even tackled the controversy surrounding billionaire tycoon Naguib Sawiris, who owns the ONTV network airing Bassem Youssef’s show. Like its models, the US Daily Show and The Colbert Report, Youssef also features new books on the show and interviews guests. The crux of the show isn’t his straight-faced humour, charisma and sarcasm, or even in the actual production of the show; the draw is Youssef’s unique take on and dissection of Egyptian politics. It’s difficult not to be charmed and swept away by him, and you’ll soon find yourself thinking in the same playfully sardonic way. Except for fans of President Mubarak. “I wish that my show angers you,” he told them.